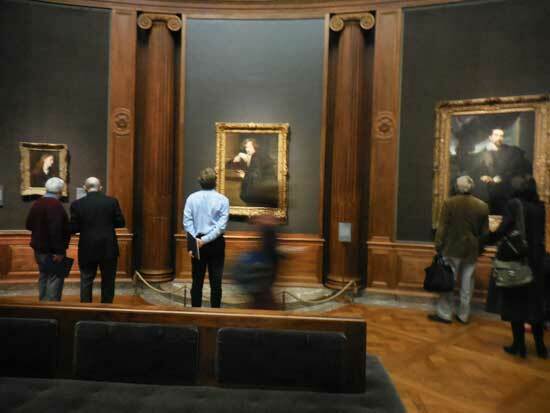 Picking on the Frick: Is It Shortchanged by Its Significantly Downsized Expansion Plan? “We’re able to achieve everything we need,” Ian Wardropper, the Frick Collection’s browbeaten director, told Robin Pogrebin of the NY Times about his institution’s revised renovation and expansion plans. Before the Frick can get “everything we need,” its plan (revised and reduced after the 2014 proposal was derailed by opponents) must be scrutinized by various city bodies whose approval is required. The press release (linked in the first paragraph) mentions the Landmarks Preservation Commission and the Board of Standards and Appeals, but I believe that the local Community Board also gets to weigh in. If all goes according to plan (unlikely, if past is prologue), the revamped facility will break ground in 2020. The target date for completion has not yet been announced, nor has the progress towards raising the $160-million construction budget. If the rejiggered, pared-down project does proceed, it may give the Frick what it “needs” (Wardropper’s word) but not everything it had originally wanted to best serve its mission and its art. That goal would have been more fully accomplished by the scotched plan. I had been an outlier among critics, in praising that ill-fated 2014 proposal. Under that scenario, construction would have started in 2017 and been completed in 2020 (the year now targeted for groundbreaking). Another downside of the new plan, as reported by Pogrebin, is that the museum may have to close during construction for as much as two years, which would not have been necessary if the space occupied by the garden had been available for use as a construction site. Making a virtue of necessity, Wardropper this week told the Times: “I think we’ve come up with a more elegant plan and a more rational one.” Some 60,000 square feet of existing space will be “repurposed,” rather than added to or replaced, under the plan adopted by the Frick’s board on Wednesday. Most crucially for critics of the earlier plan, which was designed by Davis Brody Bond (DDB), the 1970s gated “viewing garden,” designed by Russell Page, will be restored by Lynden Miller, rather than obliterated by the new construction. The trade-off for saving the garden is foregoing construction of “a proper loading dock,” as Wardropper told Pogrebin. An appropriate loading dock ought to have been a high priority in upgrading a museum of masterpieces. To me, it’s charming but less essential than the purposes to which the Frick had planned to put the space. 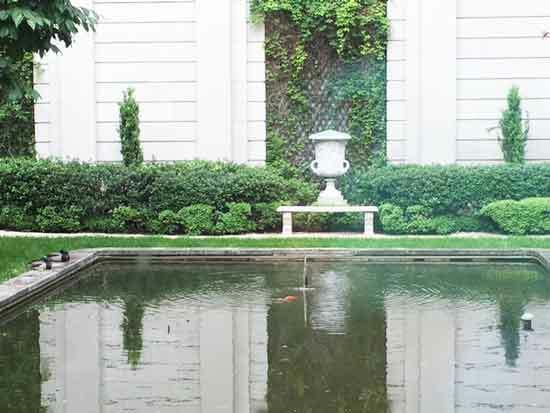 From chatter I’m seeing on Twitter among critics and preservationists, it looks like the garden guardians are warming up to do victory laps around Page’s pond—most notably Michael Kimmelman, the NY Times‘ putative architecture critic (who rarely covers art museums any more). Although it devises “creative solutions to minimize new construction” (in the Frick’s words) the new plan is not entirely cause for celebration. 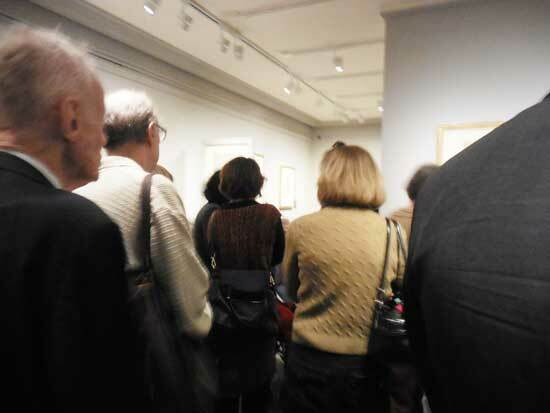 Plan A of 2014 would have given the Frick 42,000 square feet of new space. Under the Plan B, there will be only 27,000 square feet of new construction. But the Frick’s total square footage will increase by only 18,000 (from 179,000 to 197,000), because of the loss of existing space from elimination of mezzanine levels in the library. Below is a before-and-after photo essay to help you visualize the transformation—something that’s hard to do from the Frick’s publicity and the journalistic accounts derived from it. The 1977 Reception Hall (to the right of the entrance hall), which offers a view of the Page garden, would have been entirely replaced as part of DBB’s sweeping re-do. Instead, it will be reconfigured, in keeping with architect Annabelle Selldorf‘s “interstitial architectural interventions” (her words). Above it, a new second level will be added, where the museum shop (now on the main floor) will be relocated and the Frick’s first-ever café will be built. The area on the main floor that is currently occupied by Music Room (the circular space, upper right on the floor plan), where concerts and lectures are now held, will be transformed by Selldorf into three galleries for special exhibitions. Above the new special exhibition galleries will be new conservation facilities. 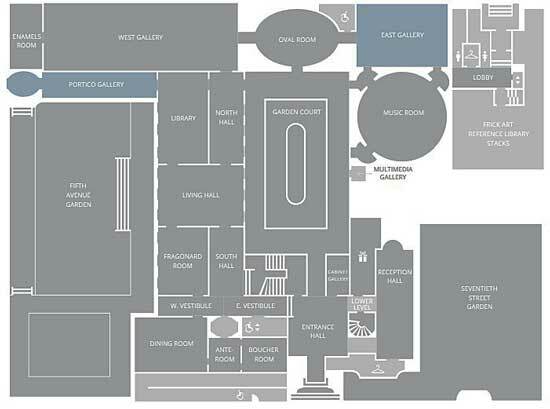 The addition of these galleries is expected to return the centrally located Oval Room (top center in the floor plan) to its intended use as a gallery for the permanent collection. Also planned on the main floor is a new education space. The acoustics for the subterranean auditorium (which will have 220 seats, compared to only 147 seats in the Music Room) will be engineered by Arup, a multi-faceted firm that includes acoustics design under its very wide umbrella. I would have hoped for a dedicated architectural acoustics firm with deeper concert-hall experience, especially since acoustics are problematic in the current Music Room. 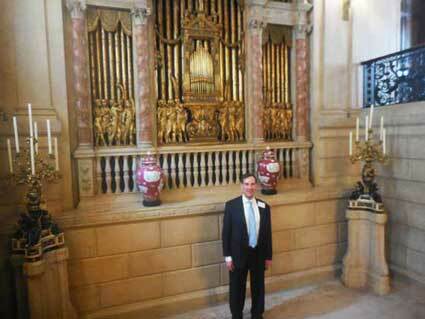 A very welcome “repurposing” will be the use of previously roped-off upstairs rooms and hallways as display spaces. But the configurations, furnishings and intimate scale of those domestic interiors, where the Fricks once lived, will limit what they can be used for—smaller paintings, drawings and objets d’art. 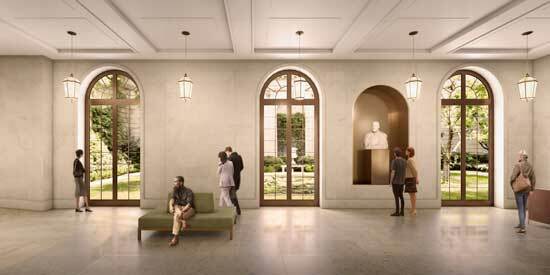 The new galleries replacing the Music Room will total 1,900 square feet—a 50% increase in space for special exhibitions (the same as in the earlier plan). Opening some of the upstairs rooms and corridors will add 4,800 square feet for display of the permanent collection. 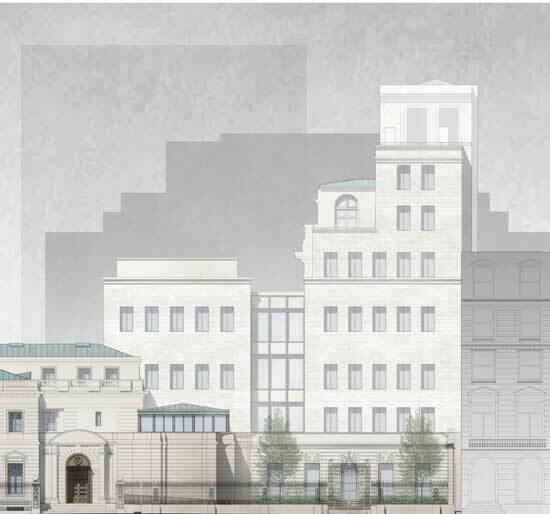 Still planned (although you’d hardly know it from the cagily understated press release) is a seven-story addition, in what is now a rear service yard between the garden and the Frick Library’s building. Housed in that new addition will be classroom space, library support space, library conservation space and other functions. In light of the retention of the Page garden, they’ve abandoned the previous plan for a rooftop garden atop the seven-story addition. 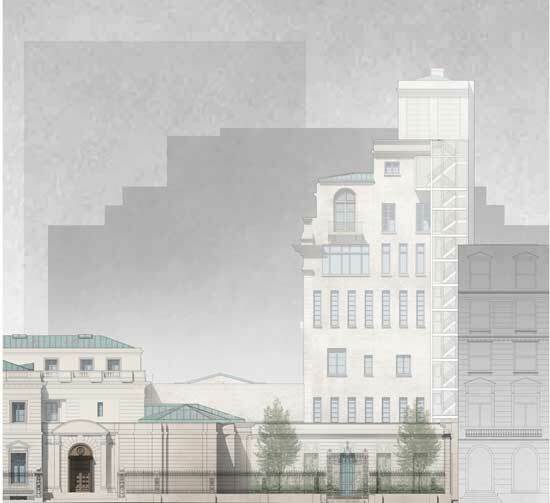 The Frick spokesperson said that “slightly” refers to the fact that “we’re only adding onto the back of the library the width of the rear service yard, rather than farther towards 70th Street” (where the front entrance is). But a seven-story addition, looming over the museum, would seem to be more than a “slight” expansion. We have raised enough of that construction figure [totaling $160 million] to feel comfortable moving forward. We plan to announce further details and publicly launch our capital campaign [which, I assume, may include money for endowment as well as for construction] in the coming months. We will seek funding from private and public sources. 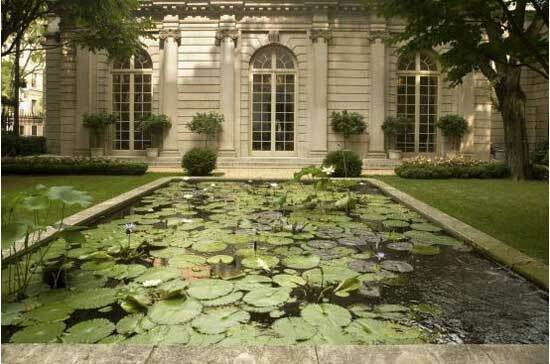 What’s important for Frick traditionalists is that the current permanent collection galleries on the main floor (to the west of the Garden Court, in the original Frick residence) will remain unaltered (aside from repairs and infrastructure improvements). Visitors can approach those galleries from the main entrance, as they always have. Despite all the changes, the core galleries should still be recognizable as Henry Clay Frick‘s Frick.